Appignani Foundation Chair for the Study of Atheism, Humanism, and Secular Ethics Presents "ON BEING A FULL AND WORTHWHILE HUMAN BEING: Can Life be Meaningful Without God?" 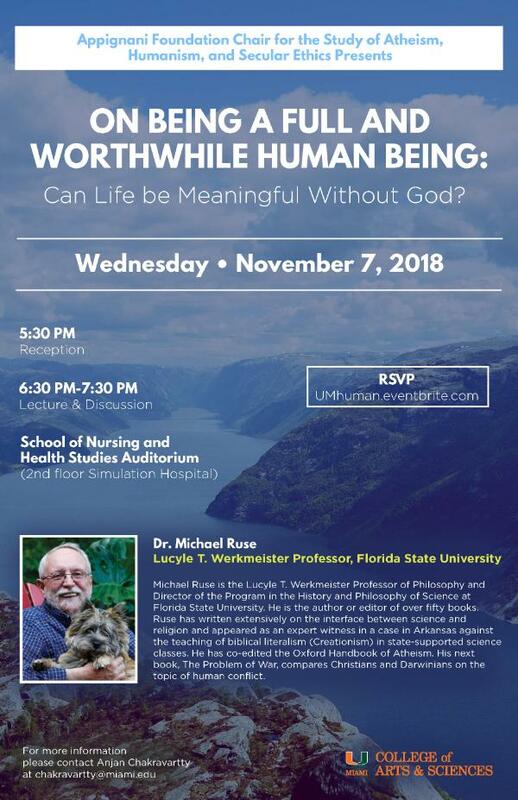 To be held on Wednesday 11/7/2018, Speaker: Michael Ruse Click Here for Event Flyer. The Southeastern Epistemology Conference will be held at the University of Miami this Friday and Saturday (10/26-10/27). Click the following link to view the conference program‌. The Department of Philosophy is very excited to announce three new hires in our department! Anjan Chakravartty has joined our department as Endowed Chair for the Study of Atheism, Humanism, and Secular Ethics. Click here for an article about the recent appointment. Helen Yetter-Chappell and Richard Yetter Chappell will join our department in Spring 2019 as Assistant Professors.